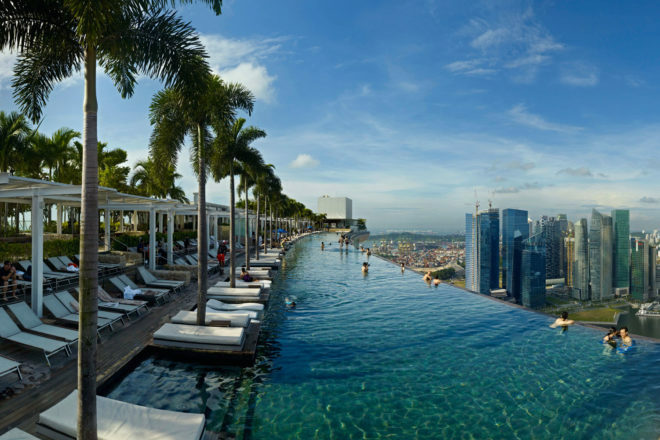 The rooftop pool at Marina Bay Sands, Singapore. Sterile, controlled and over-policed – that’s the Singapore rep. But it doesn’t have to be. One of the most accessible cities in Asia, it’s been built to please tourists and business travellers alike. So whether you like to indulge in amazing shopping and other western pursuits or look a little harder for the authentic Lion City, we’ve got your stopover sorted. Smith Street is a bustling place with hawkers selling a large range of home-grown delights. Make sure to try the spicy lobster (around $10) – a local favourite. With its freshly made local dishes and five-table dining area, this quaint little restaurant is the perfect place to come and eat like a local. Make sure to try the homemade noodles and smoked duck. Mains for $10. This mix of South-Indian and Indian-Chinese is the best vegetarian cuisine at budget prices. Indulge your senses in traditional curries and roasted naan. Mains from $5. A local institution and a culinary experience, the ultimate Singaporean meals here are chilli or pepper crab, drunken prawns, baby kai lan and cuttlefish. No. 27 on the world’s 50 best restaurants list, it’s just as you’d expect: exceptional food made from the very best seasonable ingredients. Set menu $125. If you think a nightclub is hell, then Timbre is your watering hole. An outdoor venue with alfresco dining, quiet surrounds and live music by local bands. Atop the iconic Sands SkyPark at the Marina Bay Sand’s Hotel, Ku Dé Ta is well worth the exy drinks just for the 360-degree views. A serious cocktail venue with fab lounges on the rooftop of the Esplanade – great for a mixologist-led jetlag recovery. Yes, it’s a tourist trap, but it’s a great place for kids. Beaches, Universal Studios and an Underwater World will wear them out. With the world’s most amazing collection of Orchids ($5 entry) and stunning greenery, it makes a nice break from the hum of the city. Designed for tourists but actually great fun. See (well, hear is usually more like it) the lions, tigers et al in the 40ha jungle. An amazing and authentic experience, learn to make favourites like stir fired Mee (noodles) and Hainan Chicken Rice in just three hours. Groovy fashionista laneway tucked into the middle of the Muslim quarter. See where the next-gen Singaporean style masters are shopping. The heart of Chinatown is a humming bargain hunter’s paradise. Think souvenir trinkets, ancient medicine, vibrant textiles, steamy dim-sims – and the Tooth Relic Temple. The iconic retail strip of Orchard Road is a bustling boulevard of malls and boutiques. Be warned: Orchard Road is a parallel universe – days just disappear in a flurry of credit card transactions. Cheap and cheerful, this little hostel is a stroll away from Chinatown and public transport. The best value stay in Singapore. Avg $25/night. A quirky and original boutique hotel in the centre of the creative heart of Chinatown, The Scarlet is one of the edgier places to stay. Despite a list price of $250, expect to pay about $150. A city in its own right, the Marina Bay Sands is a casino complex development with more than 2500 hotel rooms. Oh, and a slew of celebrity chef restaurants – and don’t forget the infinity pool on the SkyPark.